Dermaplaning At Home - Why and HOW You Should Shave Your Face! Dermaplaning at home is easy – and is a seriously effective way to get smooth skin. Is it as simple as just shaving your face?! Sort of…. This page will show you exactly how to do it at home for the best results. Should You Really Do Dermaplaning At Home? But this isn’t because it’s not safe to do – or that it won’t give you results. It may not give you the exact same results of course: The professionals do it in a way – using a sterile blade or scalpel – that goes a little deeper than you can at home – to the point sometimes there may be tiny blood spots (it’s still superficial so it doesn’t hurt). The added cost is not! Professionals will always recommend you see them for treatments (often for good reasons) – however you really can do dermplaning at home with excellent results. And it is much much cheaper. What a dermaplane facial does is remove the top superficial layer of skin. It basically sloughs it off to reveal the newer, fresher, more “alive” layer underneath. Allows following products and treatments to penetrate deeper, reaching the newer cells where they will actually make a difference! AKA – it removes that layer of dead skin that can act like a barrier to the good stuff. It can help even out skin tone, especially if you have dry patches of skin. Don’t be afraid of getting rid of that “peach fuzz”. Removing that hair seriously brightens your skin, makes you look instantly younger, and will not cause it to grow back thicker or darker despite the myths! Makeup application becomes so much easier. It really helps it glide on and look so much smoother and brighter. And it just feels good. Skin is so smooth to touch afterwards! Your moisturizer makes it even softer. And the razor action is really satisfying and cleansing. You will see why a lot of men enjoy shaving their face – and always feel better after doing so! Get a supply of cheap, one blade, disposable razors (Bic Sensitive Razors are good). You can also try the Tinkle women’s razor blades. You want to use one per session then throw it out. This ensures the blade is always clean, sharp, and ready. No – you don’t need any sort of dermablading tool or fancy razors! FIRST: Cleanse your face with your normal cleanser. It’s also nice to use a warm face cloth to remove any very superficial dead skin and/or makeup etc. SECOND: Pat dry, then apply a very thin layer of sweet almond, apricot, or jojoba oil to your face. This allows the blade to glide easier on your skin, is a lot more comfortable, and will allow a bit more pressure which is important (and less irritation). Wet the blade with warm water. Then start with downward strokes – start shaving with the hair growth. Move the blade slowly over your face – down the cheeks, jawline, forehead (careful of your hairline!). Rinse the blade frequently. You will see the dead skin cells and light hairs on it. Satisfying! Once you’re done – go over your face again, this time against the hair growth. Because you’ve already gone downwards and removed most of the hair, going upwards now will be more comfortable and provide a greater exfoliation. FINISH: Splash your face a few times with cool water and pat dry. Throw that razor out! Now you can apply a nice hydrating moisturizer or mask. This is also a great time for a serum or active product like retinol as it will penetrate much easier. Admire how smooth and “glowing” your skin is in the mirror. Seriously! This is a great treatment that can be done before a chemical peel as it will increase the results. This helps prime the skin so the peel can work more effectively. The easiest way is to follow with a daily peel product such as our Glycolic Daily Exfoliator 7.5%. You can also do an at home peel once every week or two. Use a firm but gentle pressure. Don’t be afraid of pressing down on the blade. Once you’ve done a treatment you will have a good idea of the pressure you can use. How Often Should You Dermaplane Your Face? A good frequency is once every one or two weeks. You can judge it by: once your skin starts looking dull again, doesn’t feel as smooth, or you notice the tiny hairs coming back. You can be flexible, it is totally fine! So get your dermaplaning supplies ready, try it, and enjoy the results! (btw this page is a guide only – please do these treatments at your own risk). Have you tried dermaplaning at home or by a professional? Let us know in the comments! Can you use coconut oil instead? I love coconut oil so it has become the only thing I use on my face oil wise. Sure – if coconut oil works well for your skin. It might be a bit thick for shaving and could clog up the razor, but there is no harm in using it! Haha – no it won’t grow back thicker 🙂 When you shave it makes the hair blunter, since it’s lopping off the fine tip. 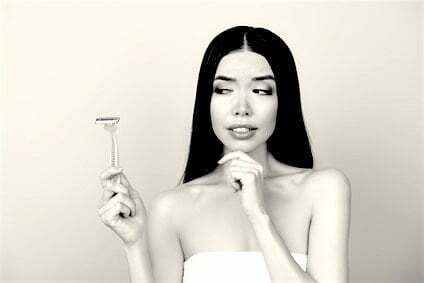 This is why it can appear thicker once it grows a bit, however it’s a myth that shaving actually causes it to grow thicker. I just followed your guide. Have always had sensitive skin and very noticeable peach fuzz. I also have dry patches. I went very light with the razor and sweet almond oil. I didn’t see much skin slough off but the peach fuzz is gone. My face feels a little warm but thats from the sensitivity. I did pat with a cool to cold washcloth and it’s starting to already feel much better. No moisturizer for me right now as I wouldn’t want to upset my skin so I’m going to wait a little while longer as the almond oil is still there anyway. Thank you for breaking this process down as I am very happy with the results! Thank you so much for your comment MeHa! I’m so happy you found the article helpful. Isn’t DIY dermaplaning great? It can be a scary thought, but it just isn’t scary at all and like you mentioned the benefits are great. You’ll be able to work out the best schedule for you skin too – whether that’s once a week or a month. All the best! I just completed dermaplaning at home! Thank you for this quick and easy step by step guide. My face feels amazing, I used a tool made for dermaplane a tweezerman brand. It stated not to go over an area more than three times. I found I went over the same patch more than three times but not at once. I have also had dermaplane professionally and had a horrible last experience. I left feeling so raw on my face it hurt! Not only that but the estheti scraped over a blemish which scarred afterwards and I was also left with scratches/cuts on my forehead from the beginning of the procedure. I think I will do this at home from now on especially being that the price of dermaplane has skyrocketed!! !